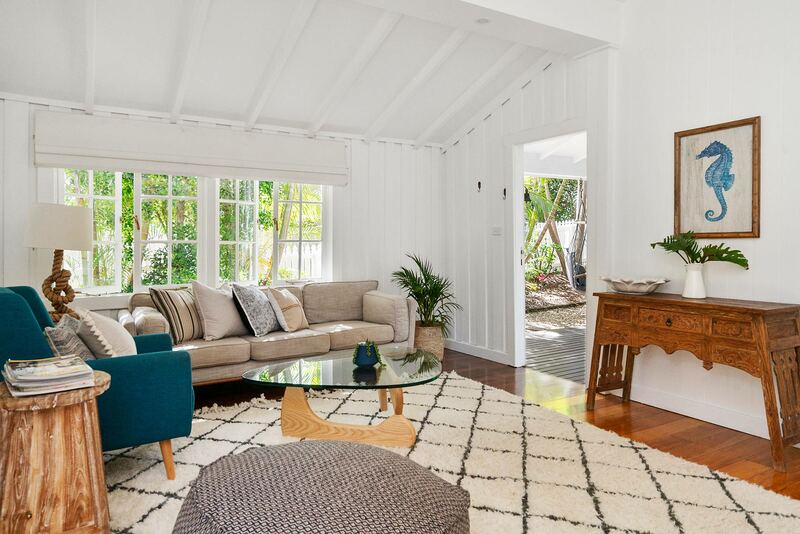 Over 100 years old, San Juan Surfers Cottage is located in the heart of town yet secluded from the outside world on a quiet, private lane. 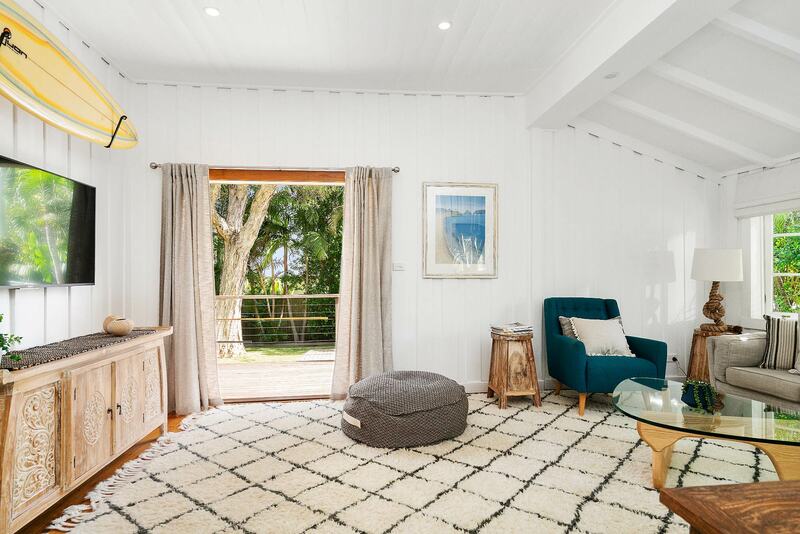 Now lovingly restored, this historic, 2 bedroom cottage combines rustic charm with modern convenience. 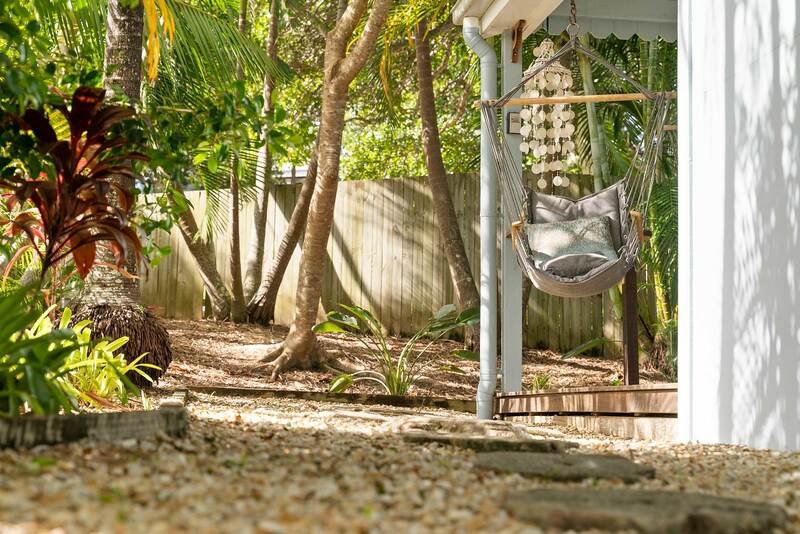 The fully fenced sub-tropical garden is ideal for children and pets, creating a welcoming home away from home. 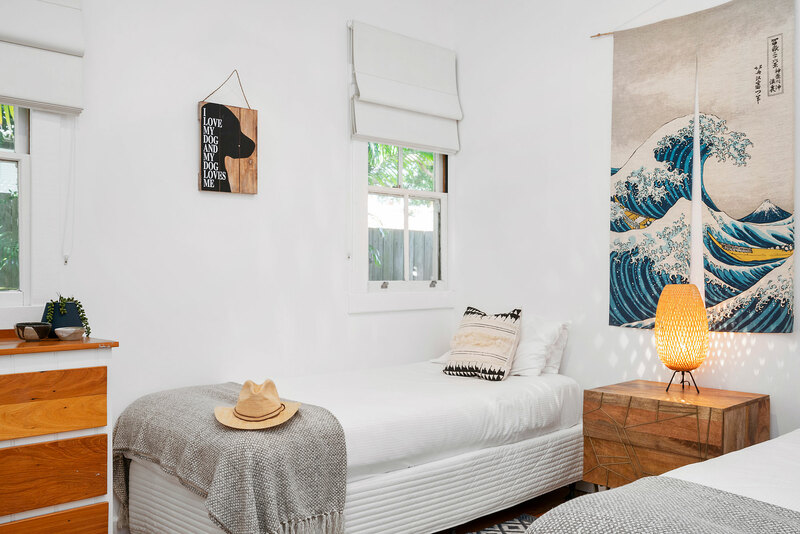 Everything you’ll love about Byron is within easy reach, from world-class surf breaks to fashionable boutiques and cafes. 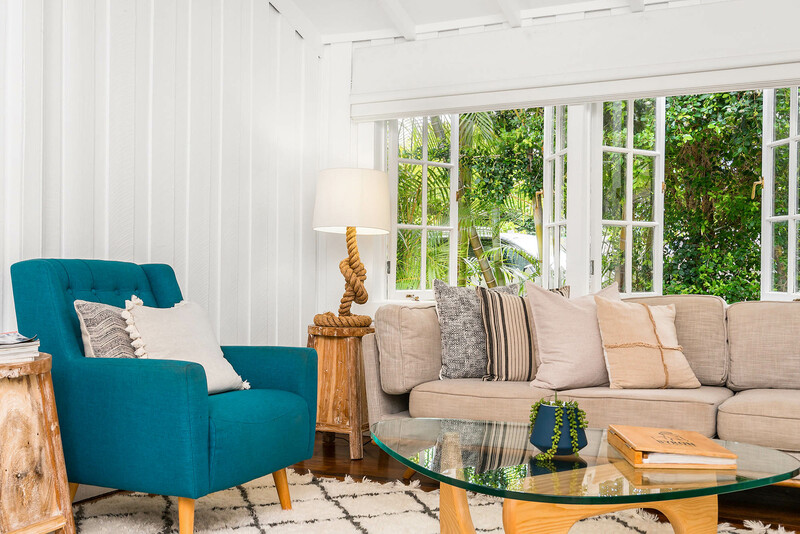 You’ll feel right at home upon entering San Juan’s inviting living space. Grab your favourite book and curl up in the comfy armchair or switch on the Smart TV and settle into the plush sofa for a Netflix movie night. 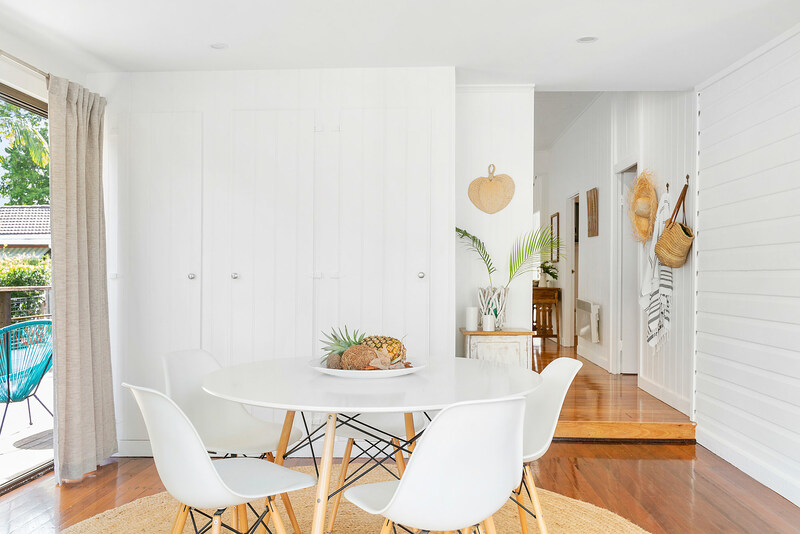 Teak floorboards and rough sawn timber wall panels give the living space a warm, rustic feel that is carried throughout the cottage. 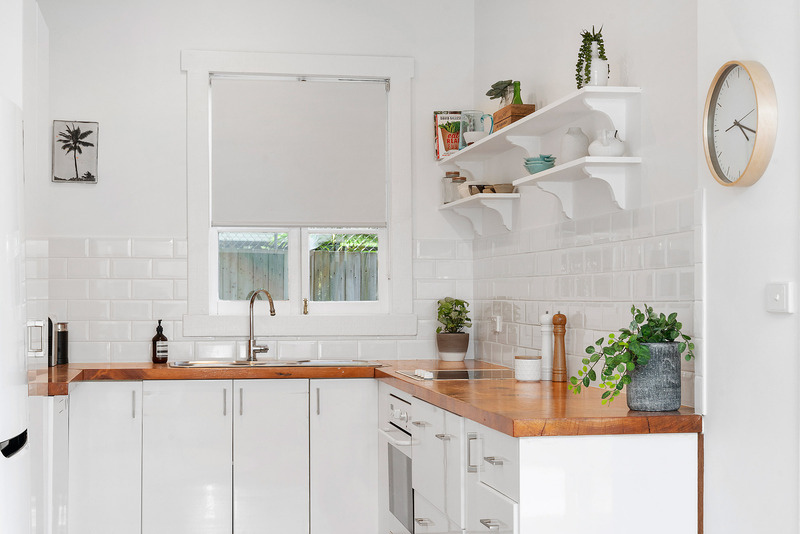 Light and bright, the modern, U-shaped kitchen is well equipped with everything you need to prepare tasty meals for yourself and others. 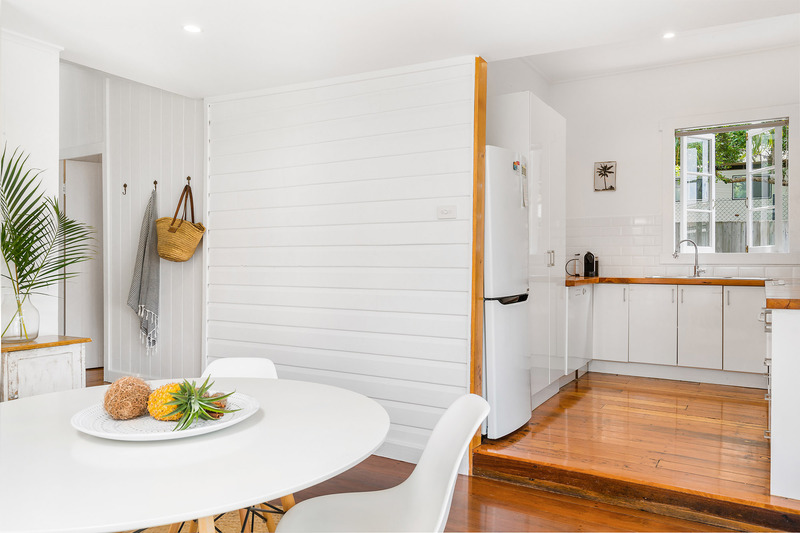 The gleaming, timber bench tops add warmth to the space, in keeping with the cottage’s casual, beach house style. Pop in your favourite pod and enjoy a fresh, smooth coffee from the Nespresso machine. Better yet, bring your coffee outside to soak up the garden and enjoy a peaceful start to your day. 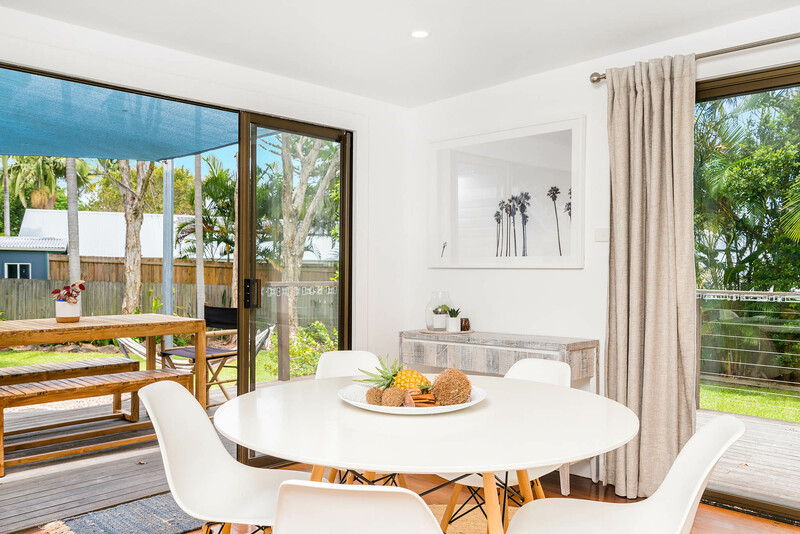 The dining room seats 4 persons, with glass doors that open to the deck and provide another cosy space for outdoor dining, overlooking the tranquil garden. 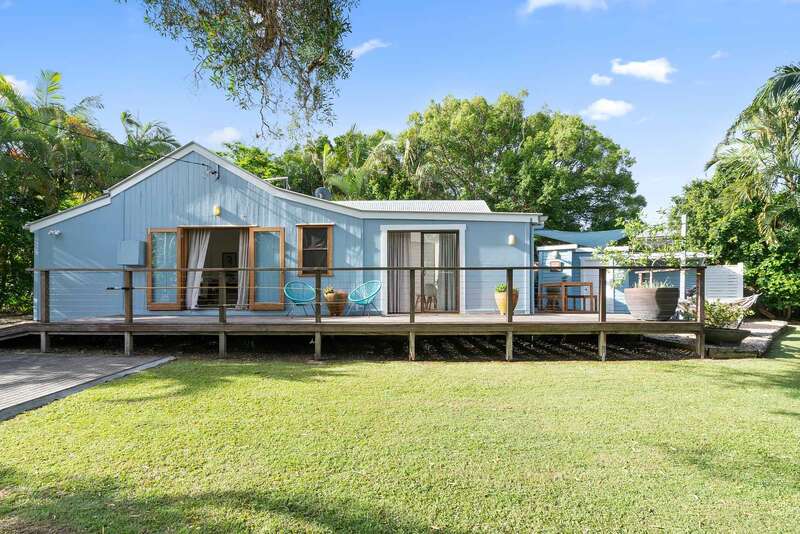 The cottage sleeps up to 4 persons. 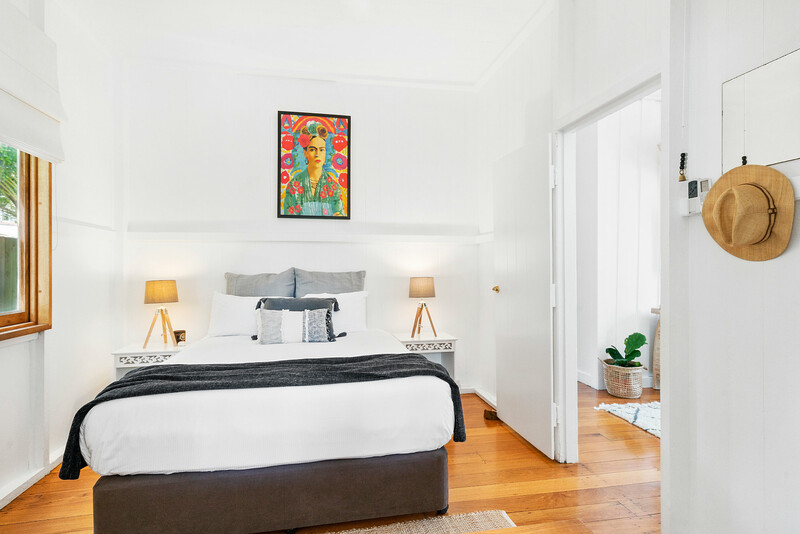 The main bedroom is a quiet retreat with a queen bed, wall-mounted TV and charming built-ins. The second bedroom offers the flexibility of 2 single beds that can be converted to a king ensemble on request. Both bedrooms have ceiling fans and reverse cycle air conditioning for your year-round comfort. After a long day of surfing, shopping, and exploring Byron Bay, is there anything more relaxing than an indulgent bubble bath? The bathroom features a deep, freestanding tub and, if you’re not in the mood for a relaxing soak, there is a separate modern rain shower encased by glass. 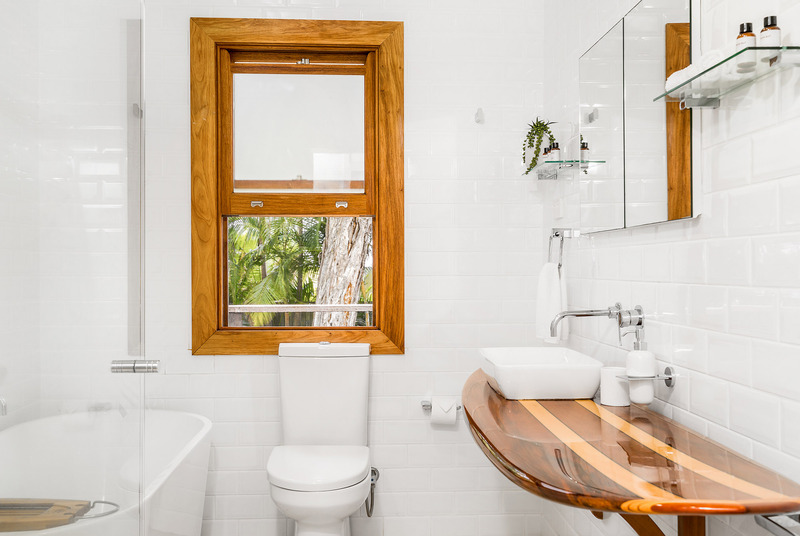 San Juan’s bathroom is flooded with natural light and you’ll love the ample space provided by the wooden surfboard-shaped vanity counter-top and generous shelving behind the mirror. Outdoors, rinse off after a surf or swim in the hot and cold shower. 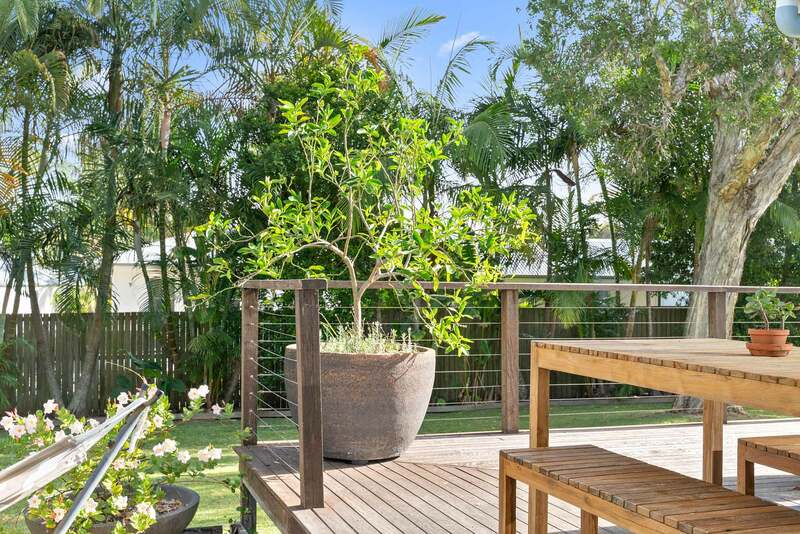 Relax and unwind on the spacious, wrap-around veranda overlooking the garden. Located just off the dining room through sliding glass doors, the deck provides a welcoming space to entertain a few friends, with ample dining and seating space. Simply kick off your shoes, nestle into a hammock, and let the cool sea breezes soothe your senses. There is off-street parking for 2 cars. 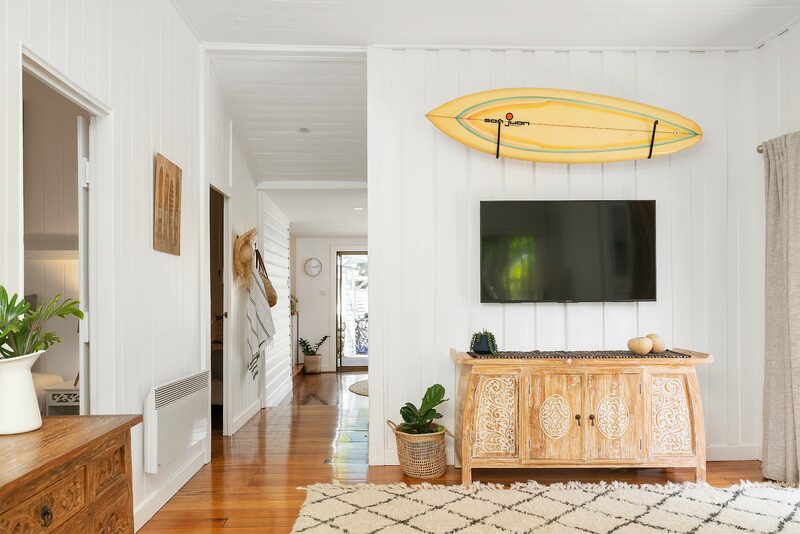 Nestled away in a quiet, private Lane, San Juan Surfers Cottage is minutes from all Byron Bay has to offer. Leave the car at home and walk or ride one of the complimentary bicycles to the beach for a morning surf or refreshing swim. 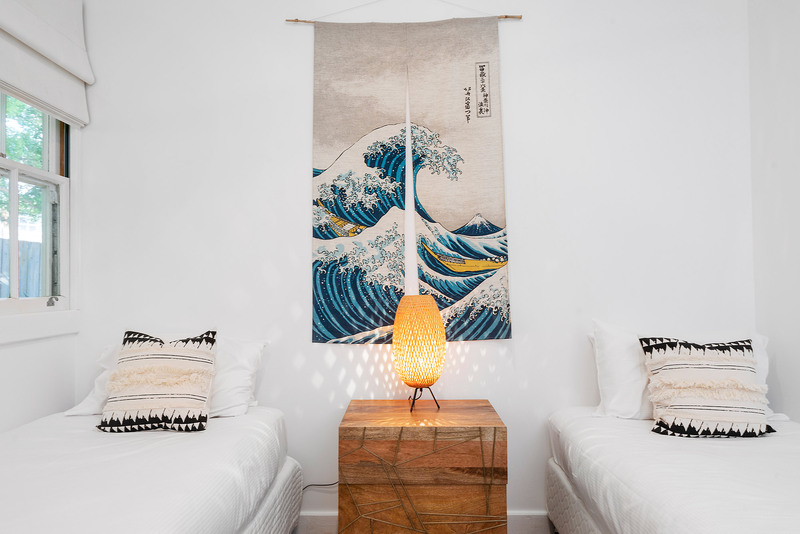 Discover Byron Bay’s most loved designer boutiques, the iconic boho-favourite, Spell & the Gypsy Collective is only 50 metres away. 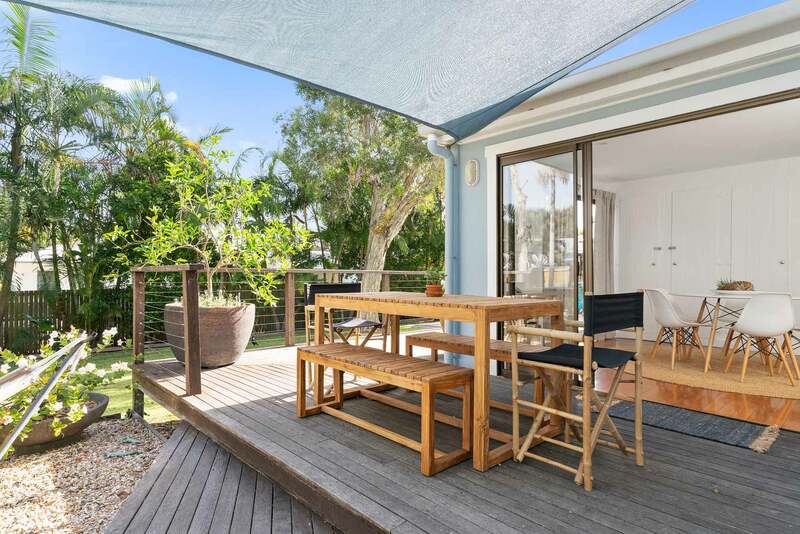 In less than 10 minutes, you can walk to Woolworths for groceries, as well as many popular restaurants and cafes, so you will never tire of living like a local in Byron Bay! 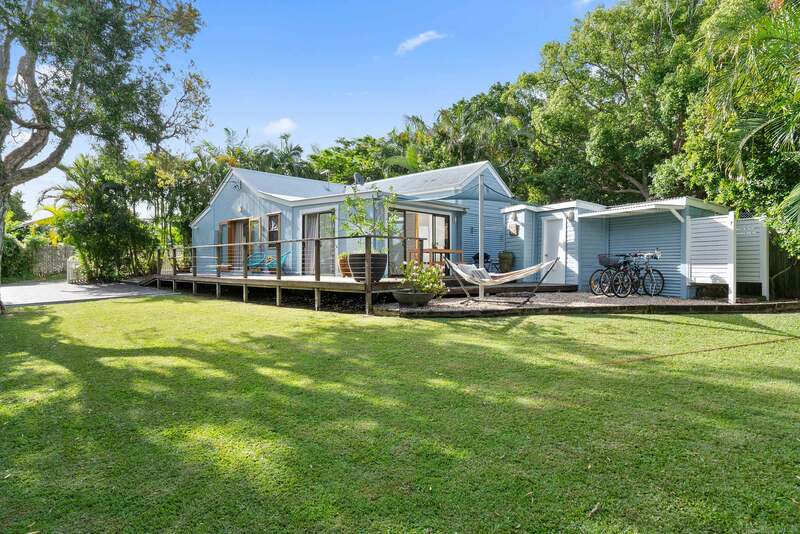 Cozy little cottage with bikes available for the guests and we just had to ride to town without having to take the bulky car! The advice about nearby attractions and restaurants was also fantastic as there is so much to choose from! It was great having the bikes available to use! Parking in the main town area is difficult so to be able to hop on the bike to ride into town and explore was great! The advice about nearby attractions and restaurants was also fantastic as there is so much to choose from! Great stay! We loved everything about this cute place.